Please refer to our stock # TG10081 when inquiring. This is a rare find - A Mosell Egyptian Revival Parure in jewel colors in excellent conditon - a real treasure. The necklace is 17 inches long and 3/4 inch wide. It is a collar type with a hook clasp. The bracelet is 6 1/2 inches long and also is 3/4 inch wide all the way around. It is unusual in that it winds around the wrist and has a clasp on top. The earrings are clips and each one is 2 inches long and 3/4 inch wide. 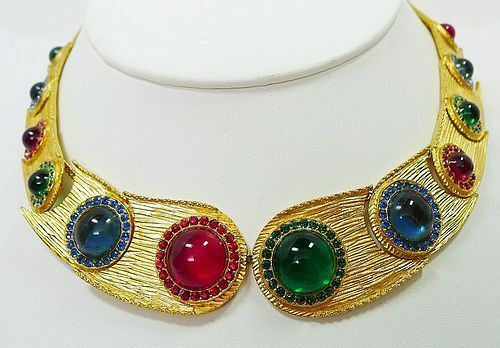 The set is gold plated and the jewels are blue, green and red, and each one is surrounded by smaller faceted sparkling rhinestones. The necklace is marked in three places as well as on the little heart by the hook; the bracelet is marked in four places; and both earrings are marked. The set is in excellent condition and doesn't appear to have ever been worn. This is truly a treasure for a collector. Since Mosell was only in business for about 20 years, from 1960 to 1980, not that many pieces were made. But Mosell is real quality and most of their pieces look like fine jewelry, truly beautiful stuff.